The Anglican Church should express regret over the consecration of a gay bishop in the United States, the general synod has recommended. Many Anglicans, especially in the developing world, were opposed to Gene Robinson's appointment - raising fears that the Church could split. The Archbishop of Canterbury will now join church leaders from around the world to discuss the divisive issue. 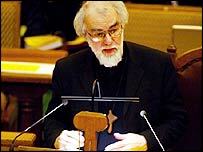 But Rowan Williams warned the issue was "not going to get better in a hurry". The row following Bishop Robinson's appointment in 2003 had "weakened if not destroyed... talking the same language in the Anglican Communion", he told Thursday's general synod debate. "Not having a common language, a common frame of reference, has been one of the casualties of recent events and there is every indication that that is not going to get better in a hurry," he said. "There will be no cost-free outcome from this... to put it as bluntly as I can, there are no clean breaks in the body of Christ." The Church of England's governing body met on Thursday to discuss ways to prevent a split over the handling of homosexuality. The synod looked at the Windsor Report examining the aftermath of Bishop Robinson's appointment. The report urged the American Anglican Church to express regret. The synod passed a motion put forward by the Bishop of Durham accepting the report's principles. But it also urged primates of the Anglican Communion to take action to seek reconciliation within the Church. Dr Williams will attend a crucial meeting of the Communion - leaders of the world's 38 self-governing Anglican churches - in Belfast later this month, to look at the Windsor Report. But despite the synod's support of the report, there was still criticism of the publication. Stuart Emmason, from the Diocese of Manchester, described it as the "ultimate fudge". It seemed "profoundly un-Anglican," he added. "The whole sorry affair fills me with sadness and, I have to admit, a certain anger." The consecration of Bishop Robinson in New Hampshire in 2003 outraged many Anglican clergy in the developing world. At a meeting of Church leaders at Lambeth Palace in 2003 some warned that the consecration would "tear the fabric of the communion at its deepest level". Archbishop Peter Akinola, leader of Nigerian Anglicans, said at the time that he was "appalled" at the decision. Bishop Akinola said the American church had put its "cultural-based agenda" above "obedience to the word of God". But Reverend Richard Kirker, general secretary of the Lesbian and Gay Christian Movement, has called for a change in the Church's stance. He said the Church would be able to "sort this problem out" if it connected with the "basic Christian principle that everybody is equal in the sight of God". 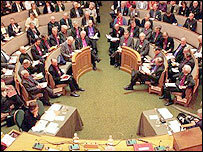 The divisive debate came the day after the Church took its first step towards the consecration of women bishops. The synod voted to continue discussions over the issue at its summer meeting.